There are many wonderful, artistic fences in our neighborhood, but New York City is much too cold to wander around and spend time outdoors sketching. 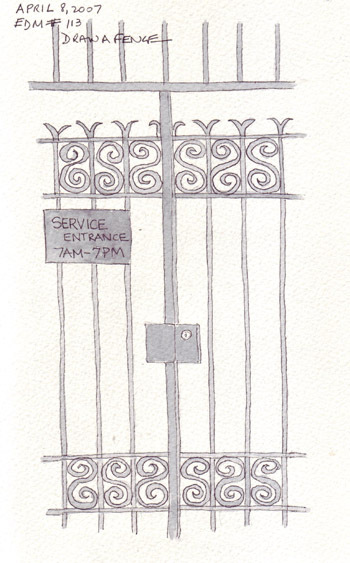 So I opted for a really simple sketch of the fence for our apartment building service entrance. Most apartment buildings in the city have a main entrance and a service entrance - or multiples of both depending on the building size. The service entrance is used for deliveries and remains locked much of the day. What is sometimes surprising to folks who live in other parts of the country, everything, or almost everything, can be ordered and delivered to your apartment. My personal favorite is our fire wood delivery man and the Christmas tree delivery guys because I love the holidays in the city. Even all of the very good restaurants deliver right off of their regular menu, although if I'm eating that well, I want to enjoy the restaurant ambience for those prices. Very nice fence. I love the simplicity of this drawing...very pretty. Shirley, this is unique and quite well done - cudos to you! Yet another approach which makes the challenges so interesting. BEAUTIFULLY DONE, SHIRLEY!!! It's cold here too in NC ...!! I really like simplicity and spontaneity of this. Very nice drawing. Elegantly simple. Nice work, Shirley! Absolutely, you should do a Manhattan journal! I'd love to see what you come up with! I'm going be in NYC for a few days and will try to get back to the Rubin Museum where I met you a while back----am doing sketches mostly of Chinatown while I'm there. The is very simple and beautiful! Yes, NYC does have lots of very interesting architecture and accents. Beautiful, graceful fence and you did a fabulous job on it. Love all that scrollwork.